Warm Christian Greetings to you from all of us at 23rd Publications! Pick & choose using the list above! We'll add the total of all your Stations of the Cross booklet choices together and give you the lowest possible price on the whole group! Just make your choices and check-out as usual. Each one of us has a disability of one sort or another—some are visible and obvious (needing a wheelchair, for example, or even glasses for reading). Others are invisible but no less prominent (dealing with chronic illness or daily pain). As Holly Clark points out in these poignant and profound reflections on Jesus’ journey to Calvary, Jesus chose the disability of the cross, and by doing so, ennobles our own suffering and gives us courage. These prayers will strengthen and inspire and offer hope and spiritual healing to all, no matter what your disability may be. Peek Inside! See the ENTIRE CONTENTS of this ▲ Stations of the Cross booklet here. Walking with Jesus on his way to Calvary can take on special meaning for us as we face the pains and changes that come with getting old. By connecting many aspects of aging to Jesus’ Passion and death, this insightful and poignant Way of the Cross shows us how close Jesus is to us on our journey. It opens our eyes to the new beginnings that this time of life can bring and assures us that Jesus will give us the strength and courage to face our challenges with faith and patience, endurance and compassion, spiritual vigor and true wisdom, cheerfulness and generosity, and optimism and abiding hope. These thoughtful prayers and reflections, meant to be prayed alone or with others, help us see the grace and beauty of this time of life. Praying these Stations is not just for the elderly—it’s also for anyone who cares for and walks with seniors into this new stage of life and spiritual growth. Pope Francis has called the Church to become more merciful. We are invited to imitate Christ who, in his way of the cross, offered mercy to the world. Even though we continued to live in selfishness and sin, he loved us with the tender heart of God. He revealed God's face to us: a Father of Mercy. These Stations are in the traditional arrangement and each includes a verse of the wonderful Stabat Mater, fitting for the Lord of Mercy. Pope Francis is calling the whole church, including himself, to live more simply, to be in greater solidarity with the poor, and to have a renewed encounter with Christ. As we walk with Jesus to the Cross, Pope Francis leads us to reflect deeply on our call to imitate him with our lives. These are the traditional Stations in their traditional setting. But here you will find a stirring approach to living the Paschal Mystery and here you will experience the wondrous power of the Spirit to touch your heart. 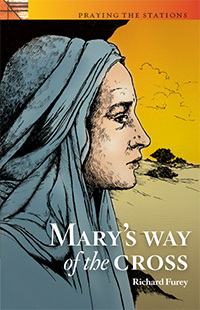 This bestselling way of the cross follows Jesus on his journey to Calvary through the eyes of his mother, Mary. With a mother's love and also with deep faith, she accompanies him and invites readers to follow him as well—with love and deep faith. Estas reflexiones sobre el viacrucis consideran el camino de Jesús al Calvario con la mirada de su madre, María. Con su amor materno y su fe profunda, María le acompaña, y al mismo tiempo nos invita a nosotros—los lectores de estas reflexiones—a seguirlo con ese mismo amor y fe. This wonderful Stations of the Cross offers catechists opportunities to view their own ministry in light of Jesus’ journey to Calvary. The prayers and reflections are addressed directly to catechists and are based on their actual teaching experiences. Jesus' journey to Calvary and crucifixion challenges all of us to reflect on our own faith journey and how we might more courageously embrace it. It invites us to respond to God's call as courageously and faithfully as Jesus did, confident that if we stay on the right road, we will gain the prize of eternal life. We are immersed in the dying and rising of Christ. This is the essence of Pope John XXIII’s ministry. It is also the message of this timely and useful booklet. Based on extensive scholarship and prayerful study, Bill Huebsch has faithfully adapted the fourteen Stations of the Cross to the message and teaching of John XXIII. Each combines the traditional Station prayer with a Psalm response and reflection about John’s life that resonates in our modern world. Perfect for Lenten parish use, and for anyone who wants to grow in Christ's gift of salvation. Also available in Large Print! A challenging and prayerful call to follow Jesus during Lent by imitating his profound compassion for those in need. A beautiful spiritual experience for today’s disciples. See the various points along the Way of the Cross through the eyes of a dedicated disciple -- yourself! Let your heart be moved by this lovely journey. This is a Scripture Way of the Cross based on the stations used by Pope John Paul II. Each station is based on actual Scriptural passages and each is beautifully written. Can be used with the traditional Stations artwork found in most churches. Highly recommended for all who want to walk the way of the cross guided by the words of Scripture. This delightful booklet is a perennial favorite because it involves children spiritually, emotionally, and physically. It invites them to ponder what happened to Jesus and how they can respond to these events in their own daily lives. This acclaimed booklet addresses many of the challenges teens confront today as they follow Jesus in their daily lives: peer pressure, drugs, alcohol, prejudice, and so on. A true conversion experience that has been widely used with 7th through 12th graders. Lent is a journey with Jesus toward the discovery of the Paschal Mystery as we are called to live it in our daily lives. Take your parishioners there with these great Stations of the Cross booklets.